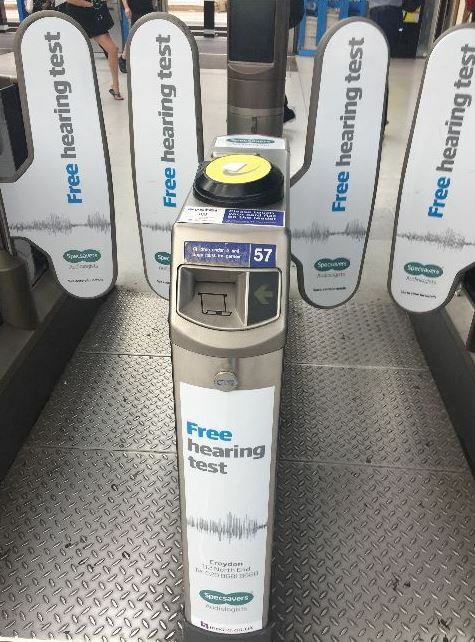 Specsavers Croydon has launched a takeover of East Croydon rail station to celebrate the launch of its new audiological services. Starting the 18 June, Specsavers Croydon is decorating the ticket barriers at East Croydon with hearcare stickers to drive awareness of their new professional status as a hearcare hub. The move will see the store substantially extend its range of audiological services, with a dedicated testing room for hearcare and the appointment of a new hearcare director to oversee the management of the services at both the North End and Church Street stores in Croydon. Charlotte Pearson, who will head up the audiology department, said: ‘We’ve spent a number of years cementing our reputation as the go-to place for optical services in the local community and now is our chance to ensure we replicate this for audiology. To celebrate the launch, the North End branch of Specsavers Croydon will also be hosting a party on Friday 23 June, with the Specsavers big ear mascot in attendance and a number of prizes to be won by customers. The store will also be joined by a local representative from Specsavers’ Audiology partners, the Hearing Dogs, who provide specialised support for people with hearing impairment in the shape of a four-legged friend. ‘Our new hearcare status also gives us a fabulous opportunity to work more closely with the hearing dogs, who maybe haven’t had the recognition they deserve. We’ve made a donation to them for their support in launching our new services.